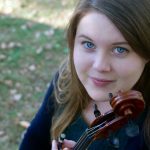 Melissa Hamilton is a graduate of the Eastman School of Music, where she received her BM and MM in Viola Performance as a student of Atar Arad and James Dunham. While at Eastman, she was violist of the Augustine Quartet, which served as quartet-in-residence after co-winning the 1987 Cleveland Quartet Competition. Along with participating in intensive quartet studies at both the Aspen and Norfolk summer festivals, the Augustine Quartet presented concerts throughout the U.S. and competed in both national and international competitions. 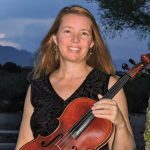 Before returning to her hometown of Tucson in 1997, Mrs. Hamilton was the adjunct viola instructor and violist of the Pacific String Quartet at Western Washington University and a substitute violist with the Seattle Symphony and Seattle Opera. She now performs with the Tucson Symphony and True Concord, and especially enjoys performing chamber music for If Music Be the Food and other community-oriented concert series. This fall, Melissa begins a new teaching position at Cornerstone Christian Academy, where she will have the privilege and joy of introducing kindergartners to great music and art.